Advertisements for bigger and better technology gadgets bombard us daily. It seems like there is always a more advanced cell phone or television that you need to get your hands on. Though color TV was made mainstream in the 1960s, the race to advance screen technology for color enhancement is ongoing. In this post (in honor of this year’s “Chemistry Colors our World” theme for National Chemistry Week), I will discuss how nanotechnology is being used to improve color displays in today’s TVs. 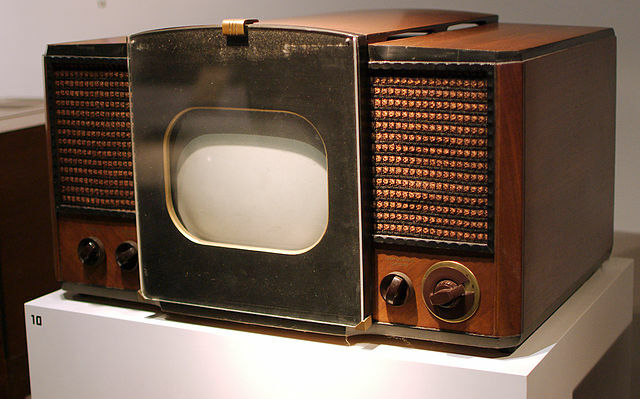 Today the most common home TVs contain a liquid crystal display (LCD) with light emitting diodes (LEDs) for backlighting.1 The LCD was a huge improvement in television technology over the cathode ray tube; it helped reduce energy consumption while allowing screen size to increase. It also improved color accuracy, making colors appear more vibrant.2 However, LCD screens still do not have ideal color quality. 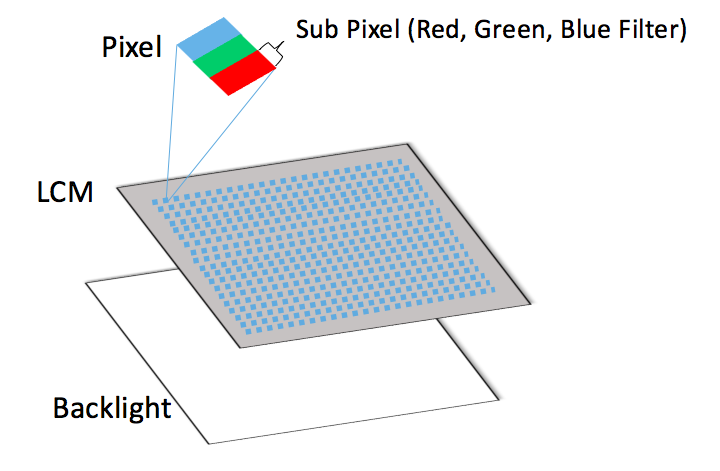 To explore why this is, let’s look into the mechanics behind an LCD screen. Figure 2. The two primary layers in an LCD TV display. A backlit LCD TV is composed of two panels. The back panel is a Back Light Unit and the front panel is a Liquid-Crystal Module (LCM) containing millions of pixels. The function of the Back Light Unit is to continuously illuminate the LCM with white light.2 As you may recall, white light contains many different colors of visible light. This means that the LCM needs filters in order to eliminate unwanted colors – otherwise the screen would just display a blank white block all the time. To improve color quality on LCD screens, quantum dots (QD) are being incorporated into the LCD structure. But what are QD, and how do they make our TV watching experience better? In scientific terms, QD are semi-conductor nanocrystals. These are very small materials that emit light of highly specific color when illuminated. To conceptualize how small a QD is, I like to think of its size relative to that of a baseball. A typical baseball has a diameter of 7.5 centimeters. QD can vary in size, but as an example, if one was 5 nanometers in diameter, it would be 15 million times smaller than a baseball! (To put it in perspective, a toddler is about 15 million times smaller than the diameter of the earth!) That’s REALLY small! Additionally, the emission color of a QD, or the color you see, depends strongly on its size. This means that the emission color of a QD changes if you change its diameter! 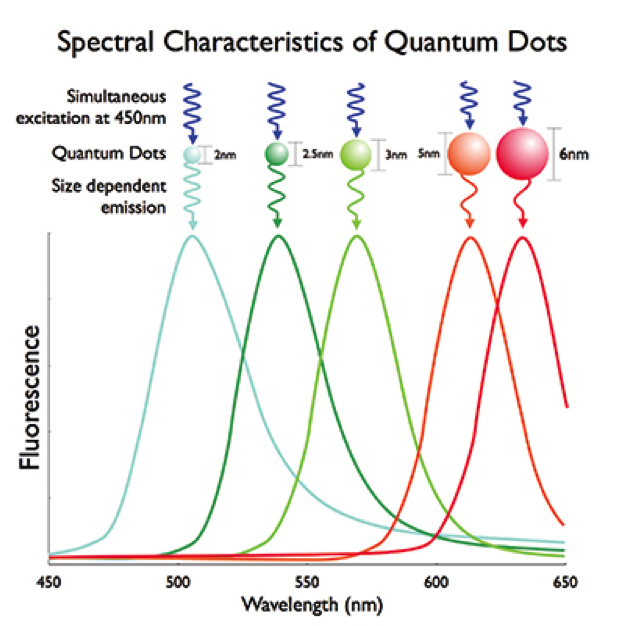 Specifically, the smaller the QD, the bluer its emission and the larger the QD, the redder its emission (Figure 3). Scientists can produce QD of various sizes by changing the chemicals, temperature, and time used to make them.2 The combination of the ability to absorb light of multiple wavelengths while emitting light of a specific color based upon QD size allows a mixture of various sized QD to be illuminated by one light source while producing a myriad of colors. So how are QD being used in LCD TV screens? Manufacturers are replacing part of the Back Light Unit of LCD screens with films containing QD. One company, called Nanosys, has created a Quantum Dot Enhancement Film composed of red- and green-emitting QD embedded in a polymer film.2 This film is positioned between two plastic layers and sits in front of the Back Light Unit. In this QD-enhanced LCD screen, the QD are used to adjust the color of light sent from the Back Light Unit to the screen. Unlike in an LED-only screen, the backlight is a narrow blue rather than broad white light source. As the blue light passes through the QD film, it illuminates the QD which in turn emit green and red light. The combination of the blue light from the light source and the green and red light emitted by the QD results in a finely tuned white light. When this finely tuned white light hits the pixels and sub-pixels in the LCM, it produces intense colors. This enables a broader range of colors to be seen on the QD-enhanced screen compared to a traditional LCD screen.2 The result is more vibrant colors and a darker black which makes our TV watching experience more life-like. QD TVs are currently on the market but are expensive. Although QD color enhancement creates more life-like experiences that we crave while watching TV, I think I’m going to wait until manufacturing becomes more mainstream and prices decrease before I take advantage of this new technology. Moynihan, T. What are Quantum Dots, and Why Do I Want Them In My TV? Wired, Jan 19, 2015. Neikirk, L. Samsung UN65JS9500 First Impressions Review: Quantum Dot color & full-array local dimming? This isn’t your dad’s Samsung TV. Reviewed.com, Jan 8, 2015.